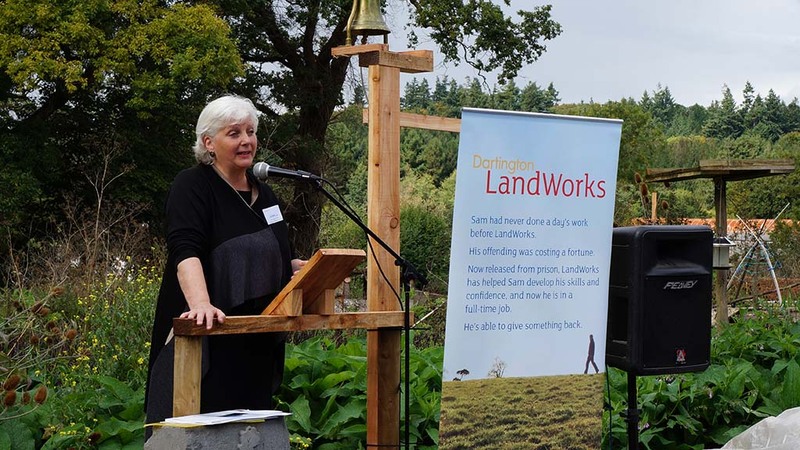 On September 18 2015 LandWorks celebrated two years of changing lives on the Dartington estate with a birthday lunch attended by 152 of our brilliant supporters. We were also delighted to welcome guest speaker Juliet Lyon, CBE, Director of the Prison Reform Trust, who praised our prisoner resettlement scheme as a ‘bright star in a rather dark landscape’. The weather was kind as everyone took the opportunity to explore the Quarry Site, meet with 12 former and current LandWorks Trainees, and learn about their achievements. From the carpentry and woodworking displays, to the market garden and cob wall timeline project, LandWorks was buzzing with questions and conversation. The woodwork shop team took seven orders for bespoke LandWorks items and we completely sold out of veg, filling the honesty box with £112.70. In all, we raised over £760 from the raffle and generous donations, and introduced another 53 supporters to LandWorks – a significant boost to achieving our goal of 1,000 supporters by the end of the year. “When you get the opportunity to see something fresh like LandWorks, to see men working in a way that satisfies them and satisfies others, where they then can leave here and earn a proper living in society, it is really brilliant. 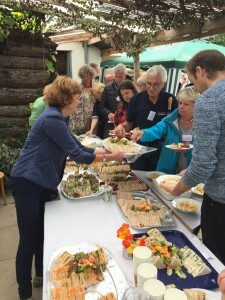 With that, everyone formed an orderly queue for the magnificent spread of sandwiches and delicious sausage rolls, freshly prepared by the LandWorks team under the expert guidance of our volunteer cook, Sue. Thank you again to everyone who attended for making our anniversary celebration so special – and to all those supporters who were unable to join us. We couldn’t do it without you.